My new job requires me to spend hours of one-on-one time with a child doing crafts. It is, for me, the best thing ever. I can’t write too much about it, but I will put up an occasional post about cool things we’ve done. Today was a good day for embroidery. I have no child experience– don’t got ’em, haven’t hung with them. I was a kid once, and that’s about all I have to go on. But I think I’m doing ok, and together we’re doing all sorts of different activities. She is learning how to needle felt, do various papercrafts, puppets, paper mache and embroidery. Every day, I try to introduce a new skill. Maybe I’m imagining things, but I think I already notice an improvement in her ability to handle/manipulate small pieces when crafting. My sister used to tell me I was weird around kids, and I think I know what– I approach them as a zoologist approaches an unknown species. I’m perfectly genial, but always making sure I don’t make a wrong step (and sometimes I say/do something that is probably completely weird). So, embroidery. Every day, I realize that after 29 years, I take my skills for granted. Everything I do now, I had to build up. I had to make tons of mistakes and form good habits, break bad ones. Today, at 29, I get frustrated when ripping stitches from a messed up hem, when my bobbin runs out around a tough corner or when I can’t find my favorite Sharpie. 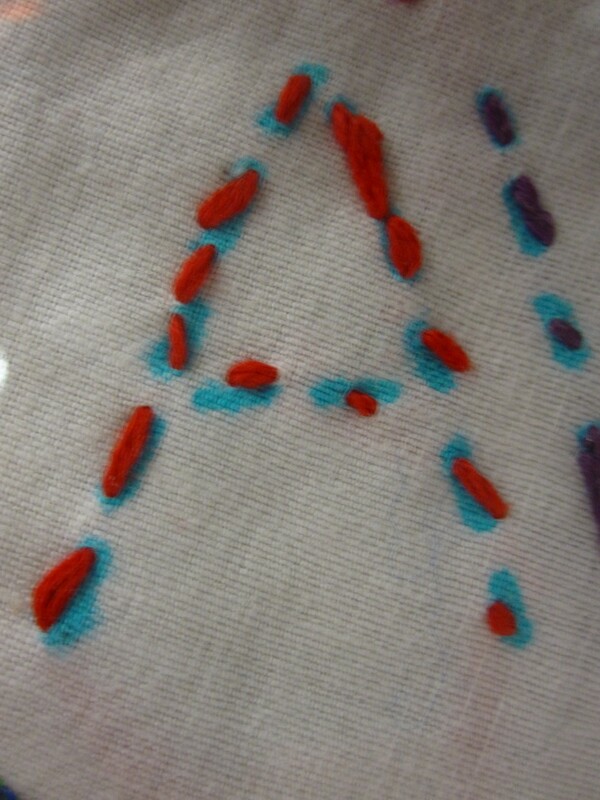 So, of course a small child doing embroidery for the first time might actually HATE it. That was early on, and I was bummed that she seemed so disgusted by the repetitive act of stitching and teasing out knots. So, after learning about Rule #1 (patience) I figured out Rule #2: put it down, try it again tomorrow. 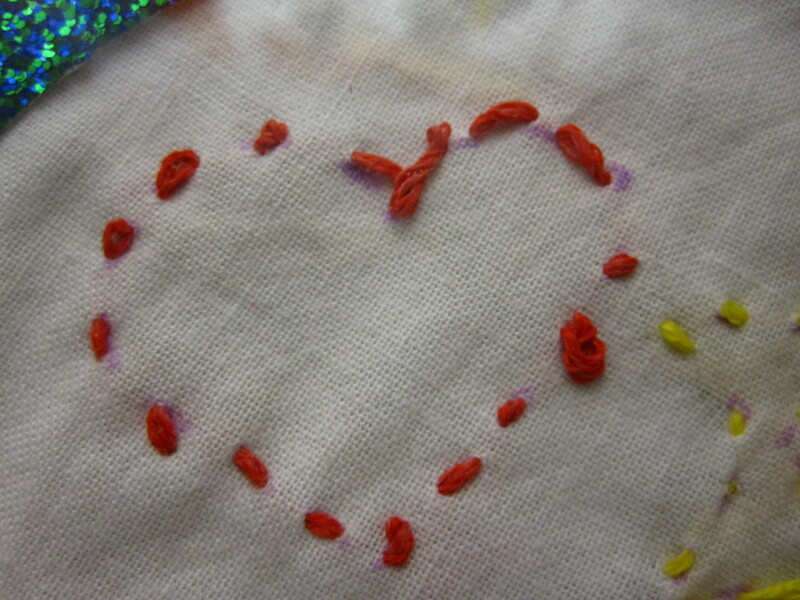 We tried it today with a piece of muslin that I pre-decorated with her name and a few easy shapes. What also helps is telling a kid what activity they will do, not hem and haw and give them lots of choices. Also, if you’ve got more than one trick up your sleeve, well, they can’t see up your sleeve. Give them what they need, and don’t tell them anything else. I’m not trying to be tricky, but if I seriously told her everything I could possibly come up with, little brains might explode. I showed her all the colors of embroidery floss I brought, showed her how to use a disc of beeswax to prevent tangles (the word “bees” got her attention). She got started, and after about an hour she had it finished. I only helped a bit with de-tangling. I wish I could post the whole picture. I took these because I’ve got her little embroidery at my house to frame it. I got a frame and sparkly paper for the mat so she can give it to her mom for Christmas. 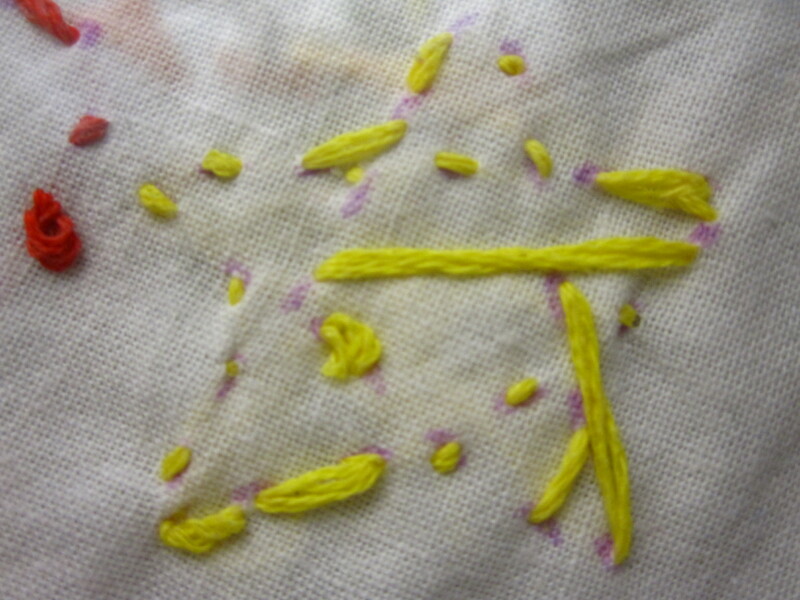 It feels nice that one day when she’s older, she might look at that little frame and remember when she learned how to draw with a needle and thread. It was a good day to be at work on my birthday.